Finally, the first cold snap of the season. To my mind, that officially opens the oyster roast season. I know technically the season has been open since October 15, but who eats oysters when it’s 70 degrees? The start of oyster roast season is a good time to remind you of some basic oyster harvesting rules. ALWAYS get a new map from the South Carolina Department of Natural Resources (SCDNR) before harvesting oysters. The South Carolina Department of Health & Environmental Control (SCDHEC) tests growing waters for bacteria on a monthly basis. Areas that are PROHIBITED or RESTRICTED may change annually. It is not safe to eat oysters from these waters! Get the latest shellfish maps from SCDNR here. In addition to seasonal closures, grounds may be temporarily closed after storm events or spills. Check on temporary closures at the SCDHEC website, or call the SCDHEC closure hotline at 1-800-285-1618. Oyster harvesting falls under recreational saltwater fishing, for which you need a license from SCDNR. You can buy a license online or locate a local license vendor here, or you can go straight to the source and get it at one of SCDNR’s licensing offices. A residential license costs $10/yr and is available in a 12-month or 3-year license. Senior citizens can get a lifetime license for $9. As with any hunting or fishing activity, there are rules to follow that help protect oysters in South Carolina. Where you can go: State Shellfish Grounds and Public Shellfish Grounds. If you get permission in the form of a harvest card, you can also go on privately-managed grounds (Culture Permits or Kings Grants). How do you know where the grounds are? Get a map at the SCDNR website above. Or better yet, check out SCDNR’s recreational harvest web app available at http://dnr.sc.gov/marine/shellfish/charlestonsouth.html. How you harvest: All oyster harvest is by hand tool only – I like a large screwdriver, but any prying device will work. Don’t forget your gloves! When you can go: During shellfish season you may harvest oysters twice in each 7 day period, during daylight hours only. 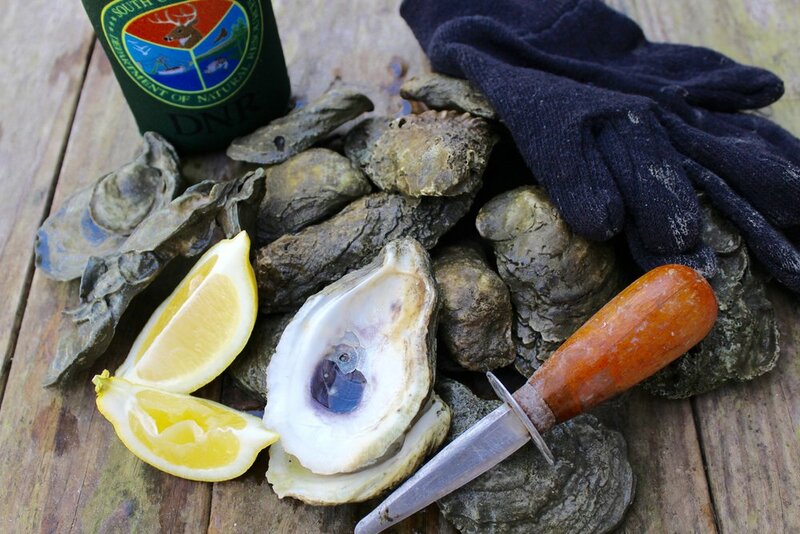 Harvest limits: Each licensee is limited to 2 bushels of oysters per day (two days out of 7). You can also collect a half bushel of clams if you wish. Each boat or vehicle can have no more than 3 limits (6 bushels) on board (with of course 3 licensed harvesters). Sustainable harvesting: SCDNR encourages harvesters to take only edible oysters 3 inches and larger. To accomplish this you will need to “cull in place.” That means you break a cluster down to smaller components (1-3 oysters say), removing all the dead shell and smaller oysters and leaving those on the shoreline. These will become next year’s crop and habitat for new oysters. How to enjoy: There are many ways to cook your oysters, and each person seems to have their favorite, so our only caveat will be to remind you that persons with immune deficiencies should never eat raw shellfish. Cooked is OK. Recycle the shell: After your oyster feast, return your leftover shells to an SCDNR recycling center. Next summer, these shells will be used to refurbish oysters reefs and even build new ones. Locations of recycling centers can be found here. About the author: Nancy Hadley oversees SCDNR's shellfish management program.